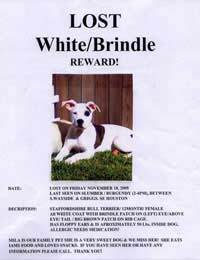 Losing or having your dogs stolen must be one of the most distressing times for animal lovers. With a little forward planning just in case this should happen, you will be able to make the public aware of your loss and speed up your dogs return to his home. When you discover your dog is missing naturally the first instinct is to panic. It’s no different to a child running off, your beloved dog has vanished and you are likely to be distraught. First do not shout and scream as your dog may think you are angry. Instead try to stay in the general areas that he went missing and call his name as if you are calling him for a meal or a game. If possible phone home and enlist help – a mobile phone is a godsend for dog walkers both for safety and for emergencies. When helpers arrive search in a methodical manner with one person staying in the vicinity of the last sighting. Ask other walkers if they have spotted your dog as it may have approached them. When you first purchase your dog make sure he has a micro chip fitted and if you move home or change your name update the details. Purchase a good strong collar with a name tag that will not become detached. Remember to keep the details up to date and put on another tag if you are on holiday. Keep a list of useful contact numbers such as the police, the local dog warden and all the vets in the vicinity so that if your pet should go missing you can notify them immediately with information and they can give you support. Take a lot of photographs of your dog and update them as the dog grows or has a haircut. Measure him so that if you are asked you can tell how tall and long he is and also knowing his weight would be a good idea. Keep a list of any scars, blemishes and unusual marks and take close up shots of these as well. Make sure you always have a left side view and a right side view. A top view looking down on the dog, and also a full face view would also help. If the dog has odd coloured eyes also note this down. If your dog should go missing make up a poster giving details of where he went missing, the time and anything unusual that was happening in the area as this will jog memories. Add several photos of your dog, in colour if at all possible. You need to put a contact number but make sure that it is one that will be manned as it is no good putting the home number and then not being there as you are out dog hunting! Never put your address as if the dog was stolen the thieves mat think you have more dogs worth stealing in the home. Never ever offer a reward or mention pet insurance as many dogs are stolen or kept until a good sized reward is offered. In fact it is this aspect of dog theft that appeals to thieves, that and stealing dogs to trade for drugs or dog fighting. Chances are that there will be sightings of your dog. Do not go rushing off calling and shouting for him. If he has been missing for a few days chances are that he will be confused and frightened and will not come to you. Leave food such as sausages for him to pick up and go to the same spot each time. Marking your territory so he recognises your familiar scent is a good idea. This would entail urinating in a bottle (at home) and sprinkling it in a small area so that he stays close by. You must keep quiet and be very patient. There are groups that will help your search and support you. Contact local dog clubs and your breeder with the latest information. The local papers should be emailed with a copy of the poster and updated as things progress and if there are any sightings. The dog warden should be phoned daily - he can be contacted through the council offices. Also any dog rescue of sanctuaries in the area as your dog may have been dropped off there. Local vets should have the poster and be followed with phone calls as staff changes may mean missing your call. Your telephone will become a useful ally in your search. On the Internet contact search groups such as Doglost who will have people in your areas who will help in the search. These people are volunteers and being dog lovers are always keen to help. Some have even lost their own dogs and can give valuable advice.